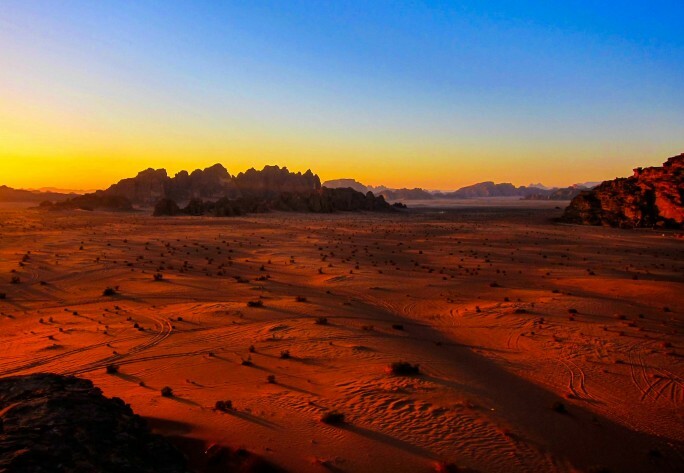 Jordan’s popular image lies with camels and deserts, justifiably so since it is about 85% desert, yet it is a country of mountains, beaches, historical ruins, and castles, rich in culture and hospitable people. It is both safe and welcoming for the entire family. Petra –A magnificent, ancient city hidden away in the craggy, solid rock mountains of the south, Petra is one of the world’s must-see attractions. A 1.2 mile walk will bring you through a narrow chasm that opens into Petra’s Treasury, a giant tomb carved out of rock, and the Temple of the Winged Lions, the Monastery, and the small Archaeological Museum, which displays artifacts found at Petra during the 19th and 20th centuries. Jerash – A spectacular Roman city, complete with colonnaded streets, grand temples, intimate marketplaces, and mosaic-floored churches, Jerash is considered one of the largest and most well-preserved sites of Roman architecture in the world outside Italy. The King’s Highway – Meandering its way north and south along the lonely hilltops, The King’s Highway links the farming towns of southern Jordan. A drive along the historic King’s Highway is the perfect way to see the beauty of rural Jordan. Don’t miss the amazing Wadi Mujib, dubbed Jordan’s Grand Canyon, for its epic splendor. Ancient Amman – Roman columns and the ruins of an Islamic-era palace tower over Amman, gazing down on a huge Roman theatre in the heart of the city. The Red Sea Diving & Snorkeling – Coral reefs and multicoloured fish await just beneath the surface of this warmest and clearest of seas. The Dead Sea – Lying 1320 feet below sea level and spanning the border between Israel and Jordan, the Dead Sea is a natural wonder. Rub mud all over your body before floating effortlessly in the dense sail water and enjoying spectacular sunsets at the lowest point on earth. Wadi Rum – Experience the majestic open desert in the company of giant mountains, red dunes, and vast panoramas. Explore by jeep, on foot or atop a camel and by nightfall, enjoy a traditional feast in a Bedouin tent then fall asleep under the stars. the world, located in the mountainous landscape to the east of the Dead Sea. You will be able to hike Jordan’s Grand Canyon by jumping, abseiling and floating. Its red walls are filled with running water that plunges through a 15 m waterfall. Language – Arabic is the official language. English is widely spoken. French, German, Italian and Spanish are also spoken in many tourist areas. Passports – To enter Jordan, a passport valid for six months is required. A single-entry visa obtained on arrival is required by nationals. You can obtain the single-entry visa on arrival at any point of entry into Jordan, except at the King Hussein Bridge on the border between Jordan and the Israeli-occupied West Bank. and souvenir stalls will only accept local/US currency. ATM machines are available throughout Amman and major cities, and in some hotels should you need to use them. Currency Exchange services are also available throughout the country. Jordan is a cash society. In most places (other than top-end hotels and restaurants) the only acceptable method of payment is cash dinars. very revealing clothing is never appropriate and conservative dress is advisable for both men and women in the old part of Amman (downtown) and outside the cities. Otherwise, you are free to dress as you are accustomed. Electrical System – The electrical system in Jordan is based on 220 AC volts, 50 cycles. The most commonly used electrical outlets in Jordan are: Type C Electrical Outlet; Type F Electrical Outlet; Type G Electrical Outlet. Visitors from North America will need a converter and adapter. Drinking Water – When traveling to any foreign country, health officials advise that you be careful about drinking water from an unknown source, since this may be disruptive to ones digestive system. Bottled water is readily available and is highly recommended. The Most Beautifully Preserved Greek-Roman City Is Where?